Some of you already know that I like to play the guitar in my spare time. And there is no such hobby that it cannot be combined with LaTeX. This is why there is my rather badly maintained musixguit package. But this isn’t what this post is about. I don’t play much classical guitar any more but am concentrating on jazz. In jazz — and especially for a rhythm guitar player — chords are much more important. And, of course, the Real Book. In the Real Book they have their own font for chord symbols resembling the early hand-written Real and Fake Books. And since jazz chords are rather unique in the way they and their alterations are written having the right font helps a lot to typeset lead sheets. It also looks better, then. One might argue that (La)TeX isn’t the right task for this, anyway, but LaTeX’s part of the fun, isn’t it? Recently I found myself having much fun doing workshops with teenagers and although there were almost no guitar players participating so far the question came up how one knows all those fancy guitar chords one needs to be able to play a decent rhythm guitar. Of course it is only really remembering a few and the rest is knowing which tones to add or to alter but I remember that when I started I found chord tablatures really helpful to help me remembering the basics. This is quite easy: finger expects a list of triples where the first number means the position (1 is the one labeled with position) the second is the string and the third is the finger. root is just the same but draws a little square instead of a circle. 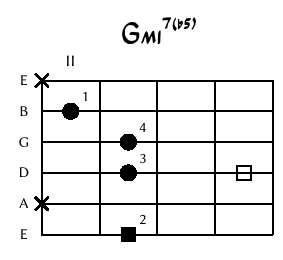 show-root only expects tuplets since no finger number is needed: it’s purpose is to show where the root lies on the guitar in vicinity to the chord.